You can now create an account in Refworks using your institutional login (TU AccessNet). If you already have a Refworks account, you can associate it with your institutional account. Choose Temple University, login using your AccessNet, provide email and name, and Voila! You’ve got an account! In Refworks 2.0 you don’t need to constantly shift from one page to another to perform simple functions as was often necessary in Refworks Classic. The same great features are now easier to find and use. Take a spin on Refworks 2.0! Here’s a Refworks 2.0 preview. Clicking on the RSS icon will take you to the url for the RSS feed. Next to the RSS icons are small information icons which will take you to the aforementioned subject guide on RSS. If you have any questions feel free to ask your subject librarian. The Temple University Libraries is pleased to announce online access to the Library of Latin Texts (Follow link, scroll down to Library of Latin Texts and click “Go”), an online collection of primary sources in Latin from the periods of the Roman Republic, the Roman Empire, and the late antique, medieval, and early modern worlds. You’ll find works by Julius Caesar, Cicero, Tacitus, Horace, Virgil, Augustine, Tertullian, Boethius, and Bede, as well as lesser known authors like Hermes Trismegistus, Minucius Felix, and Widricus Cellensis. Thousands of texts are available. You can search by author, title, period, and century. Find a word or word form of interest and you can search the database for it by the same categories, a very powerful way to track changes in style and usage over many genres and centuries. This is not an easy database to use, however, as the searcher must know the Latin author names and titles in order to search. Various browselists make access somewhat easier, but this is certainly not database for the faint of heart. (The classics resources available in Oxford Reference Online might provide some linguistic and historical aid [Latin dictionary, Oxford Classical Dictionary, and more] in finding relevant terms). Temple users now have access to online primary sources in both Latin (Library of Latin Texts) and Greek (Thesaurus Linguae Graecae). New Palgrave Dictionary of Economics now online! The Temple University Libraries is pleased to announce that the The New Palgrave Dictionary of Economics is now available online. This second edition is updated from the 1987 edition and “contains over 1,850 articles by more than 1,500 of the world’s leading economists” (go here for a more complete publishing history). In addition to the great content, the online interface is superb, providing a table of contents on the left side of each entry linking to the abstract, keywords, article sections, See Also references, and a bibliography. Below the table of contents are links to related articles. Using TULink, you can go straight from items in the bibliography to available online full-text content or to the library catalog. You can browse entries alphabetically, by topic (classification scheme from Journal of Economic Literature), or search (simple or advanced). To learn more about this great resource, take the Tour. Google Scholar has become a useful search tool because it allows you to search across the content of many different databases, including JSTOR, Project MUSE, Blackwell Synergy, Cambridge Journals Online, SpringerLink, HighWire Press, Journals@Ovid Full Text, Sage Journals Online, ScienceDirect, and many more. That is not to say that the entire content of these databases is available through Google Scholar (which has never released a complete list of its sources or the extent of its coverage) but at least some of it is there. Google Scholar also includes books from Google Book Search in its search results. Up till now, one of the problems with Google Scholar for Temple students, faculty, and staff has been the difficulty in retrieving the full-text of articles. You might find a juicy article in Google Scholar but after clicking on the link get a message that the article is blocked, even for many databases that you know Temple subscribes to. Well, this process has just gotten a whole lot easier. 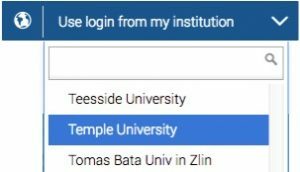 Now Temple has registered its TUlink service with Google Scholar, which means that you can link directly from Google Scholar into the library’s subscription databases. Look for Find Full-Text @ TU right after the article title and click on it. You will see the TUlink interface pop up with links for full-text if we have it online or in print, or a link to Temple’s Interlibrary Loan Form if we don’t. Go into the preferences of Google Scholar and select Temple University fromLIbrary LInks. You will find that Google Scholar is a nice addition to your research toolkit. Including it when researching a subject often brings some unusual and unexpected results. Set up your Find Full-Text @ TU preference and give it a whirl. Find Full-Text @ TU will NOT appear for books. For books, click on the link toLibrary Search at the bottom of the citation. This will take you to the record of the book in WorldCat.org, where you can input a local zip code (Temple’s is 19122) to find a local library with the book. You can set your Google Scholar preferences to use Refworks as your citation manager. In Google Scholar Preferences, just select Refworks as theBibliography Manager. The library now has The Index of Christian Art, the result of a project begun by Professor Charles Rufus Morey at Princeton University in 1917. He believed that the development of Early Christian art could be more deeply understood through the study of themes rather than artistic styles, which during the Greco-Roman period were too “uniform” (more information on the ICA). From a humble beginning of a few shoe boxes of index cards he crafted an indexing system which today falls under five broad thematic groups, Figures, Scenes, Nature, Objects, and Miscellany. The current online database covers all additions to the collection since 1991 when digitization began and thirty percent of the items indexed before 1991. It grows yearly and the retrospective digitization will eventually bring all pre-1991 content into the database. In addition to indexing Christian art, the database contains over 60,000 images both in color and black and white. For those who need to examine content that has not been digitized, they can still go to Princeton, Washington, DC, Los Angeles, Utrecht, or the Vatican to view the entire collection. The Index of Christian Art includes works of art from the early years of Christianity up through 1400 AD and recently the decision was made to expand the coverage up through the sixteenth century. The Index of Christian Art contains three different record types, which are called “databases” or simply “bases”: Work of Art records (over 57,000), Subject records (over 28,000), and Bibliographic records (over 57,000). The Work of Art records provide detailed descriptions and links to the images. Although there are multiple ways to search and browse, I found it confusing for the novice user (myself) since it’s often hard to distinguish between the actual record types and the individual fields in the records, especially when constructing a search and interpreting the results. I trust that greater knowledge of Early Christian art and more familiarity with the database would ease this burden a little (if not, feel free to let me know). The new user should start with the Multi-Base search because it lets you search across all fields and you can select which record type you’d like to search. Your results are unambiguous: if you search Work of Art records (or Subject or Bibliography records) you’ll get just that type of record in the results set. Index of Christian Art is a nice addition to our other art bibliographic and image databases, which can be found on the Arts & Humanities database list. Feel free to contact me with any questions. As the deluge of information becomes faster, wider, deeper, survey journals are one way to stem the tide and bob for air. They have been popular in science publishing for a few years now (see Nature Reviews from the Nature Publishing Group) where access and currency are at a premium. In the humanities and social sciences, with so much information to choose from and where interdisciplinarity is increasingly common, it’s very important to be able to go right to the heart of the current literature and debates of a topic. It’s a great time saver. In History Compass, I did a simple keyword search for greek or roman and came upon an article on Ancient Greek Mercenaries (664–250 BCE). It was 16 pages in length, with a bibliography of 19 primary sources and over 100 secondary sources. In Literature Compass, I did a simple keyword search for autobiography and found an article on Victorian Life Writing, which was 17 pages with a lengthy bibliography as well. Along with the survey articles, there are also “Teaching and Learning Guides”, in which the authors of articles pose a few research questions on their topic and then offer articles, books, and web sites that help address these questions. For instance, Karl Gunther wrote The Origins of English Puritanism and also A Teaching and Learning Guide For: The Origins of English Puritanism. The Teaching and Learning Guides are about two pages in length and are only available selectively. One gripe I have with Blackwell Compass is that there’s no way to search across all the Compass journals. If you are researching the ancient world, for instance, you would very likely want to search history, literature, philosophy, religion, and language and linguistics. In addition, the loosening of disciplinary boundariesover the past few decades makes this kind of broad search very important. You can leave the Compass journals and go to Synergy, Blackwell’s online journal platform, and select just these journals to search, but this seems unnecessarily complex. Hopefully this is a problem that will be fixed in coming iterations of Blackwell Compass. In the meantime, check out these journals and let me know what you think. Periodicals Index Online (PIO), Periodicals Archive Online (PAO), and British Periodicals Online are now available at the Temple University Libraries from theAll Databases list. These are superb additions for arts, humanities, and social science students and researchers. Coming from Proquest, the three databases are all related. Periodicals Index Online (formerly known as Periodicals Contents Index, or PCI) is the primary database because in addition to its own content it indexes and provides links to Periodicals Archive Online (formerly known as PCI Full Text) and British Periodicals Online. Periodicals Index Online is a growing database that currently provides access to over 16 million articles from 5000 journals in over 40 languages going back as far as 1665. Every journal or magazine indexed by PIO starts from volume 1 issue 1 so there are no gaps in coverage. The PIO interface is available in English, French, German, Italian, Portuguese, and Spanish. When you search PIO, you are also searching PAO and the British Periodicals Index. PIO also provides links toProject Muse and JSTOR journals. Periodicals Archive Online provides full-text access to 450 journals and magazines from 1665 to 1995 as well as 160 from British Periodicals Online. In all, PAO provides over 1.8 million full-text articles plus the full-text content from British Periodicals Online. As with PIO, there are links to Project MUSE and JSTOR journals. If you do any research in the humanities and social sciences, you should get to know these databases very well. For students, they will help to save time and get better grades. For faculty and researchers, they will broaden the scope of your research and reduce searching time. The Temple University Libraries now offers electronic access to 80 Blackwell companions, guides, and dictionaries in the subject areas of philosophy (59 volumes) and religion (21 volumes), as part of Blackwell Reference Online. For a complete list of the philosophy and religion titles go here. These works offer great topic overviews and nicely complement the recently acquired Cambridge Companions. While Cambridge Companions predominantly focus on individual philosophers and theologians, Blackwell companions and guides focus on subject areas, i.e. epistemology, logic, religious ethics, political theology, etc. Most of the titles in this collection are heavily used in print at Temple. Like the Cambridge Companions they are superb overviews written by prominent scholars, essential for faculty in unfamiliar disciplines, graduate students studying for classes and preliminary exams, and undergraduates researching papers. The searchable bibliographies take users right to the heart of current scholarship in a topic area. Like the Cambridge Companions, this electronic content will serve as excellent course material, most likely substituting in many instances for print texts. There is quite a bit of overlap between Blackwell Reference Online and our print collection, but the print and the electronic versions of these works will likely be used in different ways. While the print versions are great for the focused study of individual topics, Blackwell Reference Online will allow users to search broadly over all the philosophy and religion volumes, discovering associations and linkages not apparent from the separate print volumes. You can search Blackwell Reference Online using either the simple or advanced search. The simple search, which searches the full-text, offers post-search limiting by Subject, Place, Period, People, and Key Topics. It’s pretty slick, much like the way Routledge Encyclopedia of Philosophy does it. 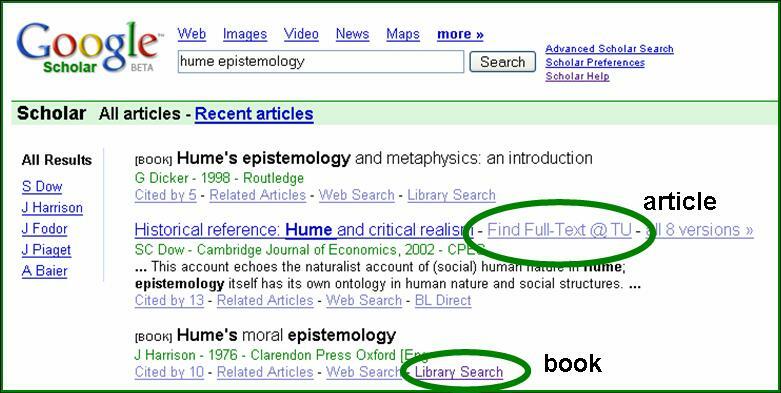 In the Advanced Search you can search authors, chapter titles, bibliographies, and full-text, as well as limiting to a particular book or subject area. You can also browse individual works. All results are presented as chapter titles or dictionary entries and are printable in full. Another great source from the Temple University Libraries. Don’t wait. Start searching now!